This weekend, I’m excited to host a ladies brunch with some mini flower arranging. 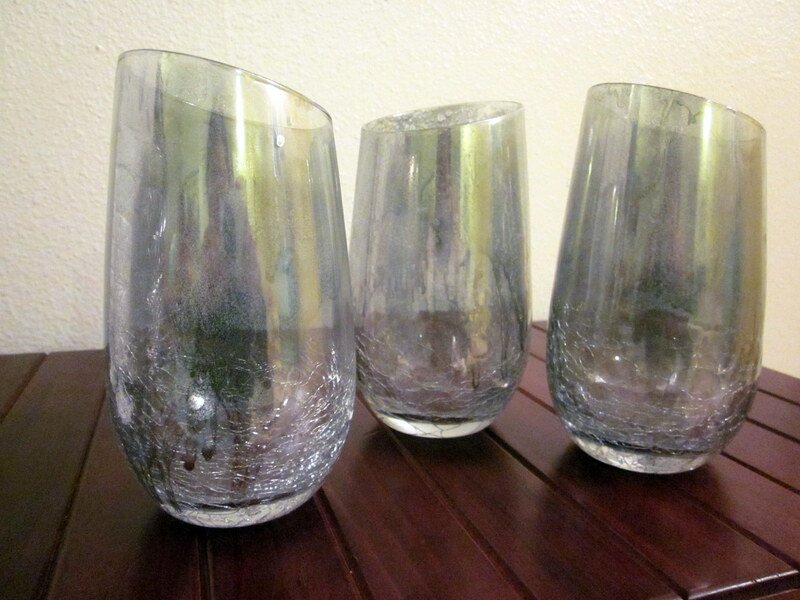 In preparation for the gathering, I decided to paint some thrifted glasses to use as vases. I found some cute glasses for $.50-$1 at Salvation Army (my fave thrift store). I attempted three different types of glass painting, but it was a bit more challenging than Pinterest made it out to be. 1. 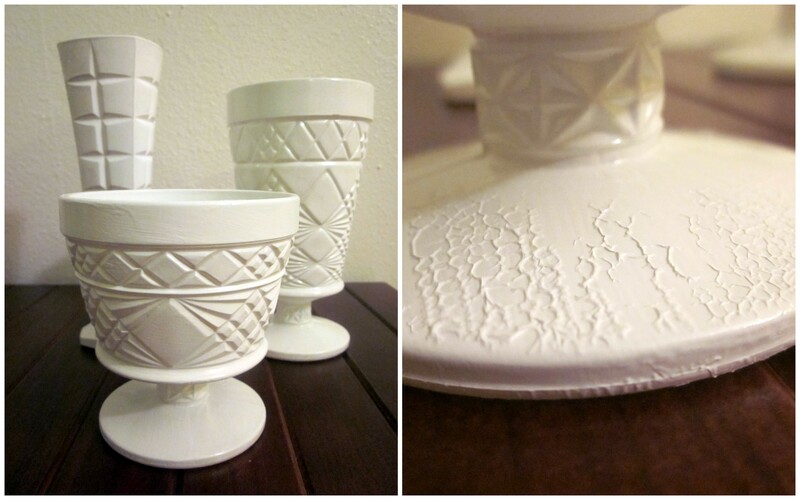 Faux ceramic – I went with a tutorial from the happier homemaker for white vases. I used Krylon Gloss spray paint. I realized I probably shouldn’t have painted the inside of the vases since they’ll likely flake when filled with water. I was spray painting outdoors on a slightly windy day causing leaves and dust to dry into the paint. I also didn’t wait long enough between coats so there was quite a bit of dripping (recommended within 1 hour or after 24 hours). I tried to fix the empty spots by brushing on acrylic paint, but it still didn’t look good. So I added another coat of spray paint. This caused the paint to crinkle and flake off. Eek. 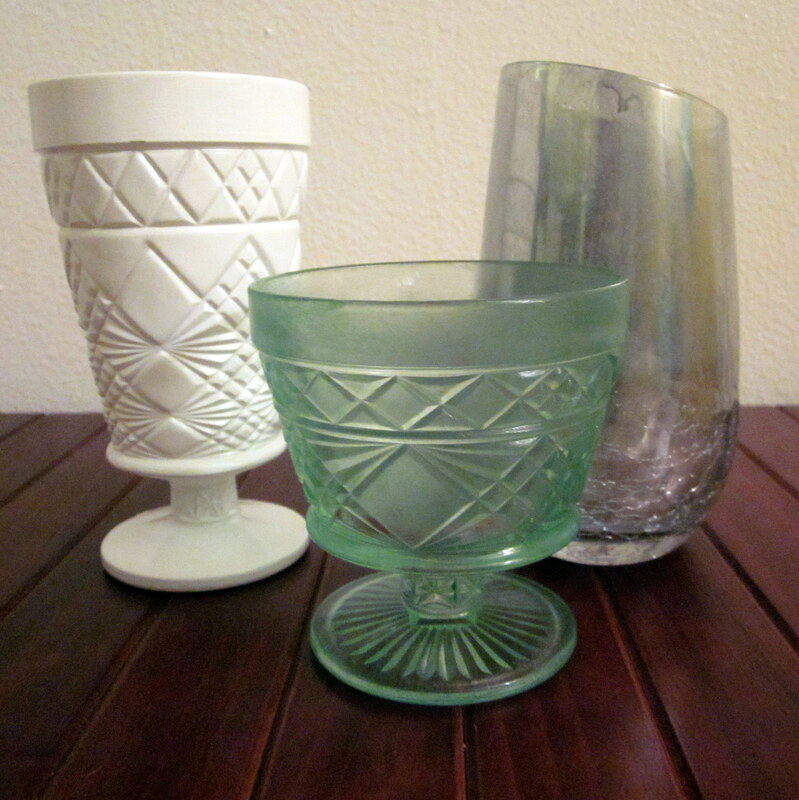 I was left with three out of five okay-looking vases. Boo. 2. 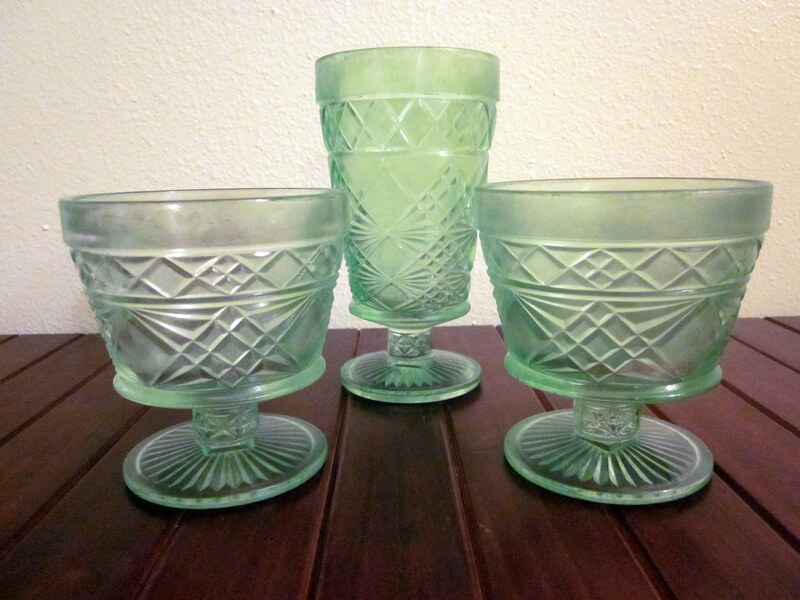 Green glass – I used Martha Stewart green gloss glass paint. It was hard to hide the brush strokes, but they look acceptable. I didn’t oven bake or let them cure for 21 days so we’ll see if the paint holds up in water. 3. Mercury glass – Pinterest was exploding with DIY mercury glass. I got the Krylon Looking Glass spray paint from Hobby Lobby. It wasn’t cheap at $12 per can. I tried two different methods to see which I liked better. 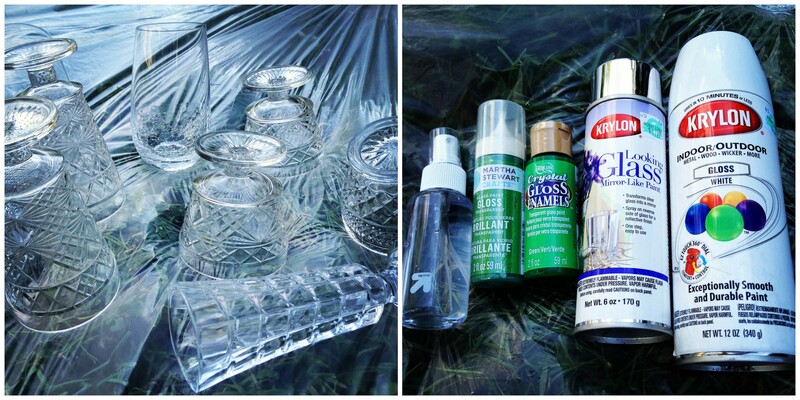 The first method was to lightly spritz water on the vase and then spray on the looking glass paint. The second method was to cover the vase in the looking glass paint and then spritz it with a 50/50 mix of water and vinegar. After 10 minutes, you pop the water bubbles with a paper towel. I definitely think the first method turned out better/more mirrored. It’s the one on the right. 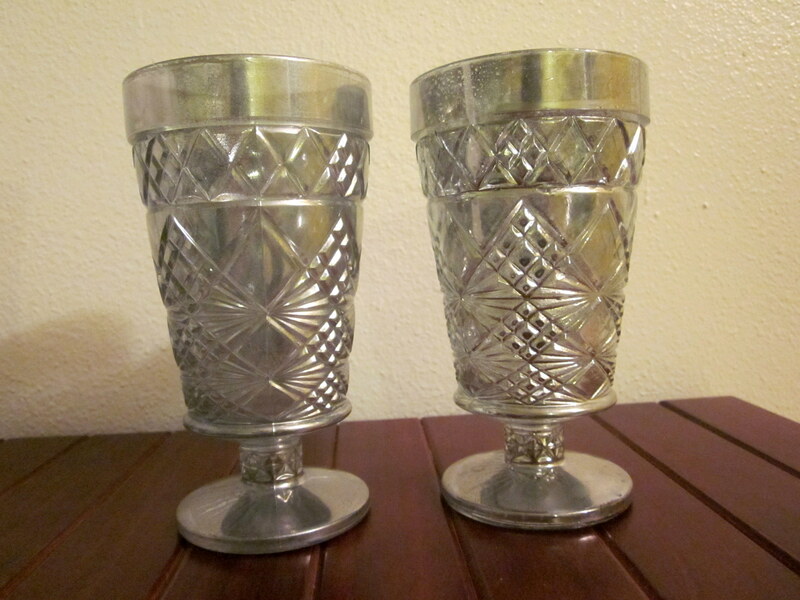 The wine glasses didn’t do so well being painted, but the mercury glass ones were decent enough to use. This entry was posted in Crafts and tagged mercury glass, painted vases. Bookmark the permalink. What a neat idea, Linda! The vases came out really nice. You’re so resourceful! The green gloss paint looks pretty cool! I can’t tell that there are flaws. Maybe with the water and flowers, no one will even notice. Hope you’ll post some pictures with the ladies and their flowers. Have a blast. Thanks Friends!! Wish y’all could join us! I’m a proud owner of one of the green gloss vases, and I love it! It’s beautiful. What a great idea. Thank you! !